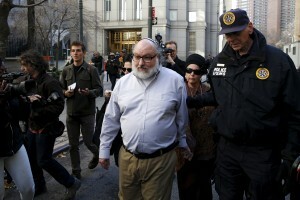 NEW YORK — Jonathan Pollard was released from prison Friday after 30 years behind bars for spying for Israel, and his lawyers immediately went to court to challenge tough parole conditions seemingly designed to ensure he doesn’t spill any U.S. military secrets he might have left. The 61-year-old former Navy intelligence analyst was set free in the middle of the night from a medium-security federal prison in Butner, North Carolina, after being paroled from a life sentence that had turned him into a continual source of tension between the U.S. and Israel. Under the rules of his release, he must wear a GPS unit to transmit his whereabouts at all times, allow the installation of monitoring equipment on any computers he uses at work or at home, and agree to periodic, unannounced inspections of those machines. “The notion that, having fought for and finally obtained his release after serving 30 years in prison, Mr. Pollard will now disclose stale, 30-year-old information to anyone is preposterous,” his lawyers, Eliot Lauer and Jacques Semmelman, said in a statement. Hours after his release, Pollard checked in with probation officers at a federal courthouse in New York, then emerged into a throng of journalists. He wore a yarmulke. “I can’t comment on anything today,” he said, his wife, Esther, on his arm. Despite parole requirements that he not leave the U.S. without government permission for the next five years, Pollard has expressed a desire to renounce his American citizenship and move to Israel, where he is seen by some as a national hero. The White House has come out against the request. U.S. intelligence officials have long argued that Pollard, who pleaded guilty in 1986 to conspiracy to commit espionage, did severe damage to the United States during the Cold War by giving away an enormous volume of military intelligence secrets that some suspect wound up in Soviet hands. His defenders have contended that his punishment was overly harsh for helping a close U.S. ally. The prosecutor who handled the case, former U.S. Attorney Joseph diGenova, said it is legitimate for the government to be concerned that Pollard might still have secrets to tell. Pollard’s lawyers submitted a statement from former U.S. national security adviser Robert McFarlane dismissing such fears. “To the extent Mr. Pollard even recalls any classified information, it would date back 30 years or more, and would have no value to anyone today,” he said. Kenneth Lasson, a law professor at the University of Baltimore who supported Pollard’s bid to have his sentence shortened, said the GPS monitoring and computer inspections amount to “vindictiveness by a petty-minded government.” He said the U.S. should grant Pollard’s request to leave the country. For now, Pollard will live with his wife in an apartment in New York, where he has landed a job in the finance department of an investment firm, said Lauer, one of his lawyers. Lauer would not identify the firm but said it had hired Pollard before the computer monitoring requirement was imposed. He expressed concern that the restriction could put Pollard’s job in jeopardy. Pollard’s lawyers also complained that wearing a GPS device would be harmful to his health because he has severe diabetes and chronic swelling in his legs and ankles. Tucker reported from Washington. Associated Press writer Ian Deitch in Jerusalem and Jake Pearson and William Mathis in New York contributed to this report.